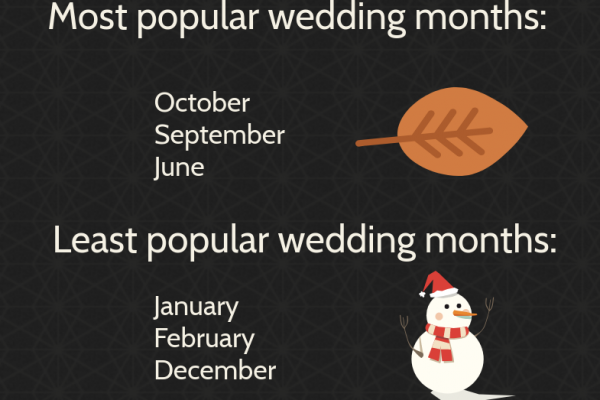 Whether you and your sweetheart have been a long distance couple, or you simply love to see new and faraway places, a travel themed wedding makes for a unique and romantic experience. 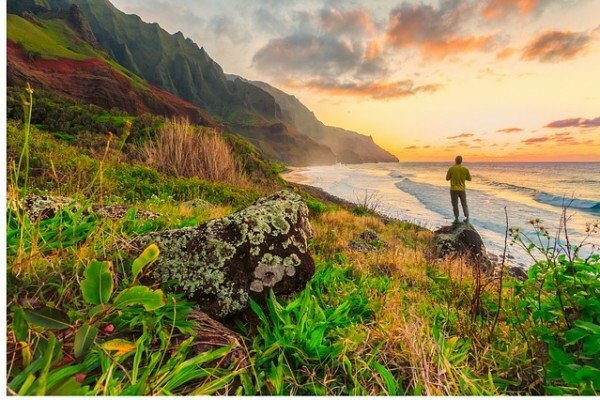 We’ve gathered a collection of travel based ideas that will make your travel themed wedding feel like you’re ready to not only see, but take on the world together. Often times when we travel, we are required to take a plane – why not incorporate them into your decor? We love the idea of mini paper airplanes as place cards. 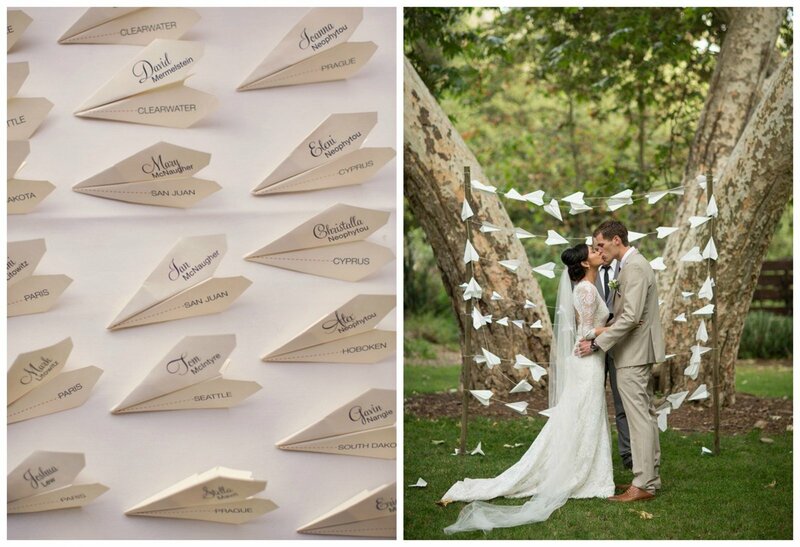 We also can’t get enough of these paper planes used in the background for wedding photos. Such a simple and sweet touch! When visiting a far away place, a passport is a necessity. 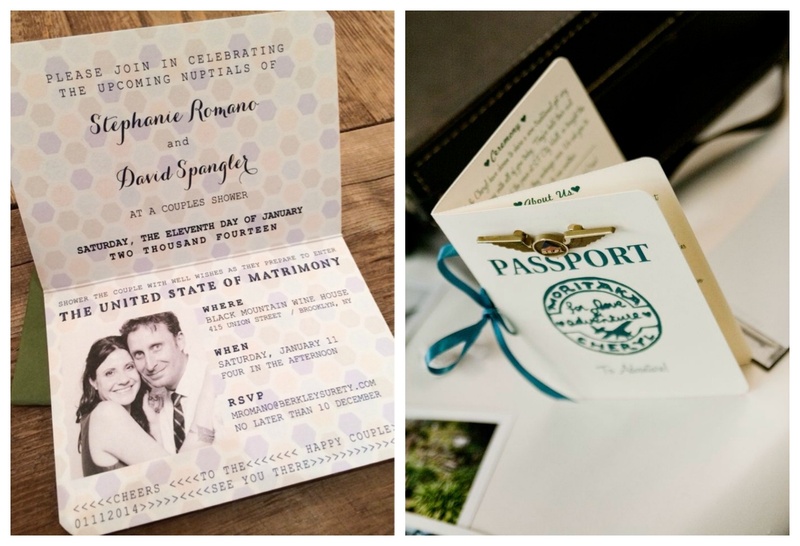 After seeing these cute invitations and wedding programs – it seems passports are a necessity for travel themed weddings too! Hot air balloons are so whimsical and pretty – not to mention one of the most magical ways to travel. Try having hot air balloon lanterns float above you and your guests. 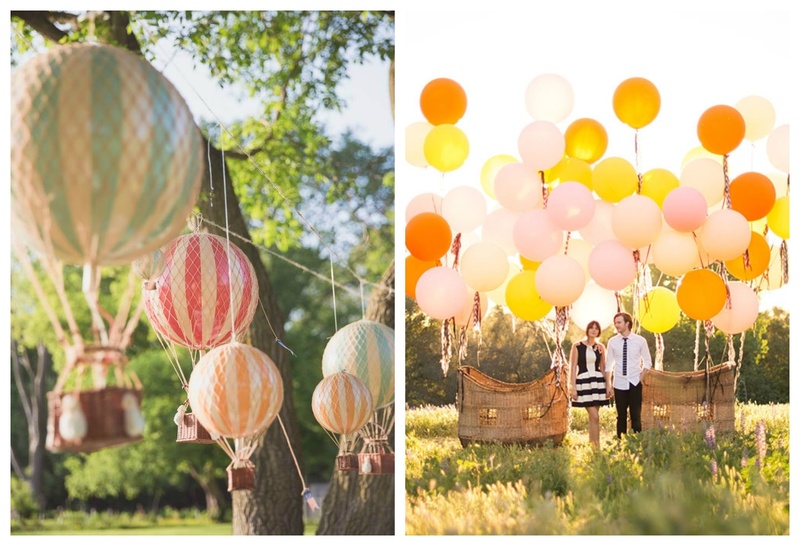 Another idea we love is using giant balloons for photographs. With hot air balloons, there’s no doubt that love is in the air. Maps always come in handy when exploring new places and make for a nice addition to decor. Maps as placemats make for a unique tables setting. 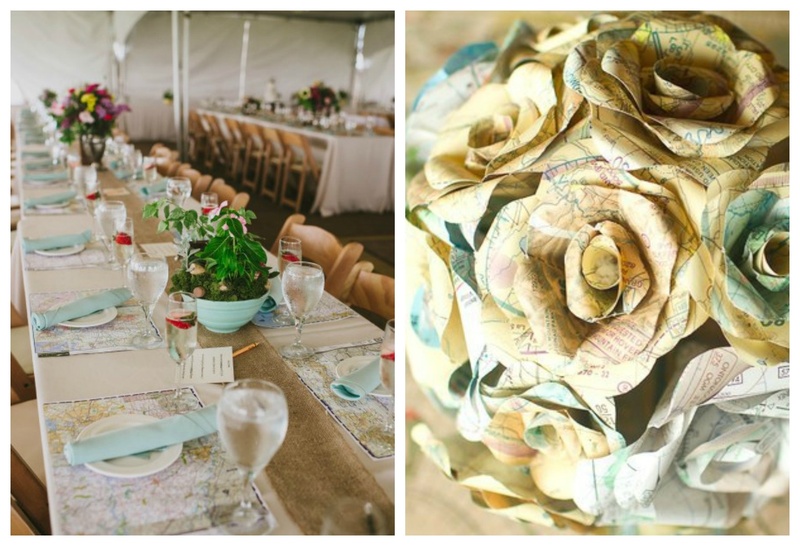 Another unique idea – paper bouquets made of maps. You can’t forget your luggage! 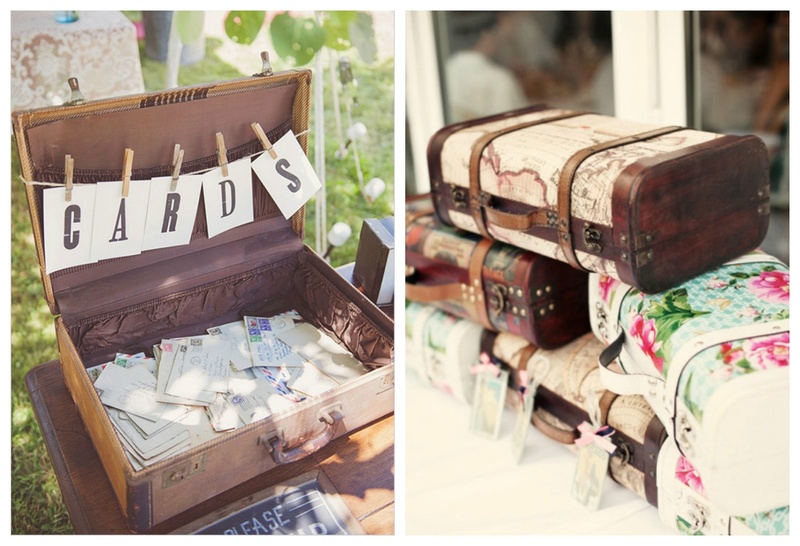 We love the idea of finding the prettiest luggage pieces you can and using them as props in your decor. Another great idea is a wishing well! Have your guests write their wishes for you on cards (or postcards!) and place them in an open suitcase. Although we may not use compasses for directions anymore (thank you iPhones!) they are still one of those items that make you think travel and adventure. 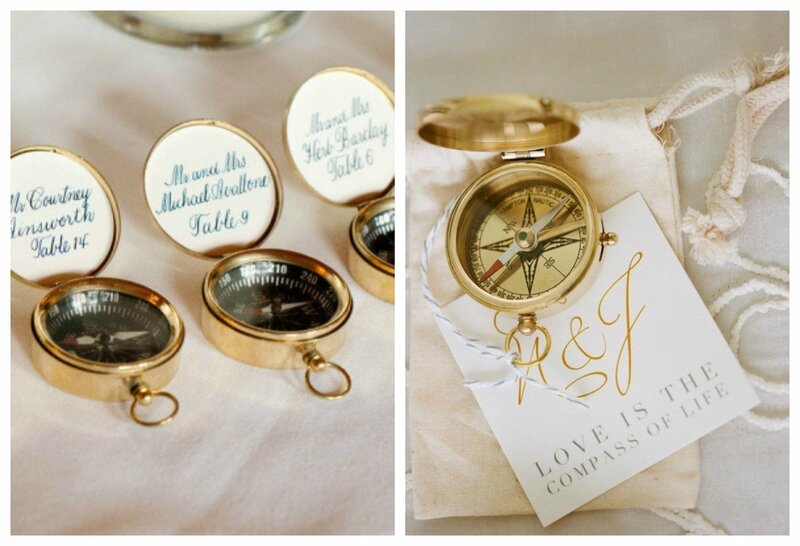 Compasses make for a special favor, and can also be a rare take on place cards. Globes let you explore the whole world with a single spin. They come in a variety of different colors and sizes that look beautiful as centerpieces. 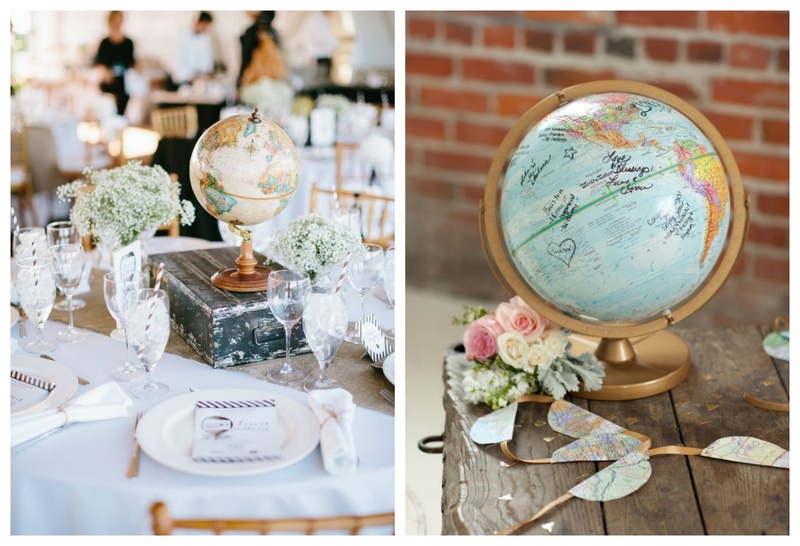 Something else to try is using a globe instead of a guest book. Leave out sharpies nearby and let guests know to sign their wishes on the globe!